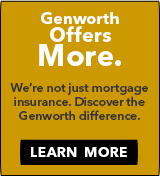 View samples of Genworth's Master Policy 1480 and associated endorsements. These are a representative sampling for reference only. Lender specific documentation is provided upon approval for a Genworth Master Policy. Visit our MI Servicing site for Mortgage Insurance Loan Activity Report (MILAR) information and servicing guides. Visit Due Diligence Resources for information and resources that support your risk management and due diligence review of our Mortgage Insurance business.